This was written by the perceptive food writer Agnes Jekyll in 1920. Disability wasn't something I'd contemplated since our daughter went from winning ski races to sitting in a wheel chair. Girls in illizarov frames can't wear trousers. It's an obvious fact but one clothes designers don't tend to worry about.This and many other disabled injustices was on our to do and make a difference list but time moved on and we rejoined the flock that looks on with sympathy but can run or cycle to beat the red of the traffic light. Fast forward ten years and I find myself needing to use sticks, correction I have just graduated from a zimmer frame, via two sticks to one. I am impatiently counting the blessings that more able folk take for granted. I viewed the first super moon or perigee moon of 2014 on July 12th in The Western Isles hospital. A perigee moon is when the moon is at its closest point in its orbit around earth, making it appear larger than usual. I watched the moon wistfully having sought a nurse's permission to pull back the curtains. I'm keen to ensure that I am escorted to the beach at low tide for the real stargazer's super moon on August 10th. It will be the brightest full moon of 2014. The high and low tides after a full moon are spectacular and are known as spring tides. The sea will lap up to the splash area at high tide and reveal subtidal goodies, which often remain hidden at low tide. Low tide is of course, when it all happens for the seaweed forager or for that matter the hunter of razor clams. The tides when there is less differentiation between low and high tide marks are called neap tides. These occur a week after spring tides and are of less interest to a seaweed forager. 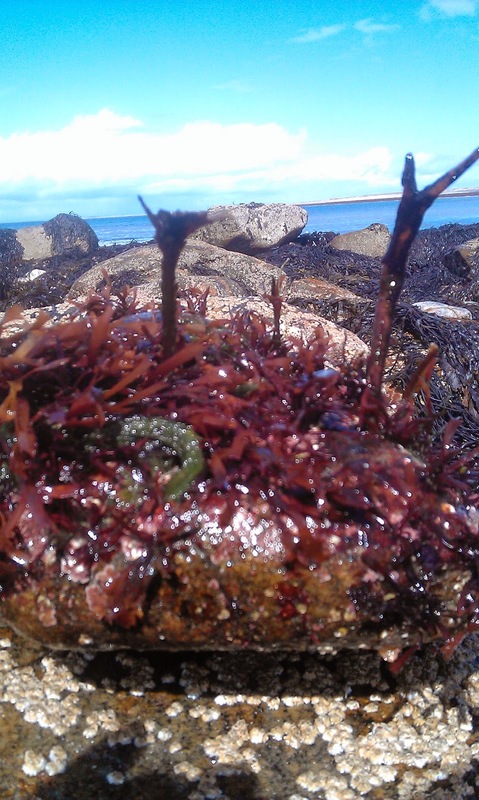 Species of seaweed thrive in different conditions.This is why there are visible bands as you wander down to the sea. Some prefer rocky beaches, some like to be covered by seawater most of the time i.e are only visible at a low spring tide and others, such as channel wrack Pelvetia canaliculata can survive for days out of water. Cooking with foraged seaweed requires discernment. A recipe, which calls for seaweed rather than a species, has been written by a cook at the start of the seaweed learning curve. Some species may bully, if eaten raw and yet add subtly when cooked. 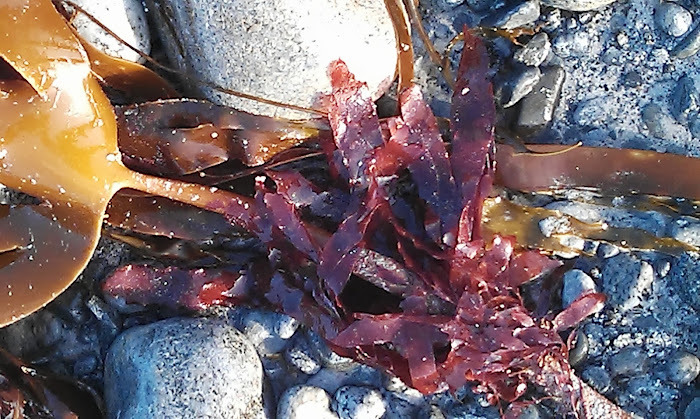 Cooking with seaweed is a relatively new idea in the west and foraging it is relatively easy, not least because hilly or rough terrain isn't involved. Sand chairs come with a price tag but are a worthy investment for coastal folk who love the outdoors. Some counties have sand chairs available for hire. A metal stick gets a good grip on firm sand (don't be tempted by pebbles and beware of sinking sand) and for those unable to bend, the stick can be used to loop up long fronds of seaweed, which may then be cut with scissors. A metal stick may became water logged but once on dry land a quick shake will remove excess water, a wooden stick won't have this problem. A rake can double up as a stick and then, be used when stationary to forage for cockles. An able bodied person may be needed for the gathering and washing, depending on your disability. 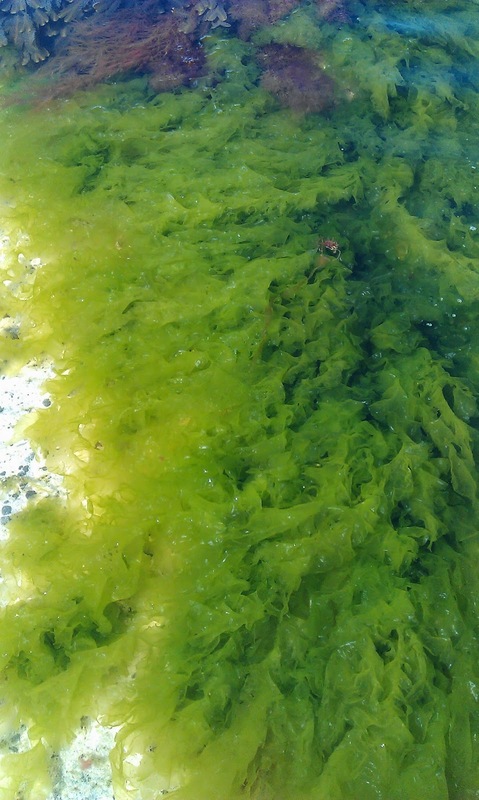 Marine botanists have much to learn about seaweed. 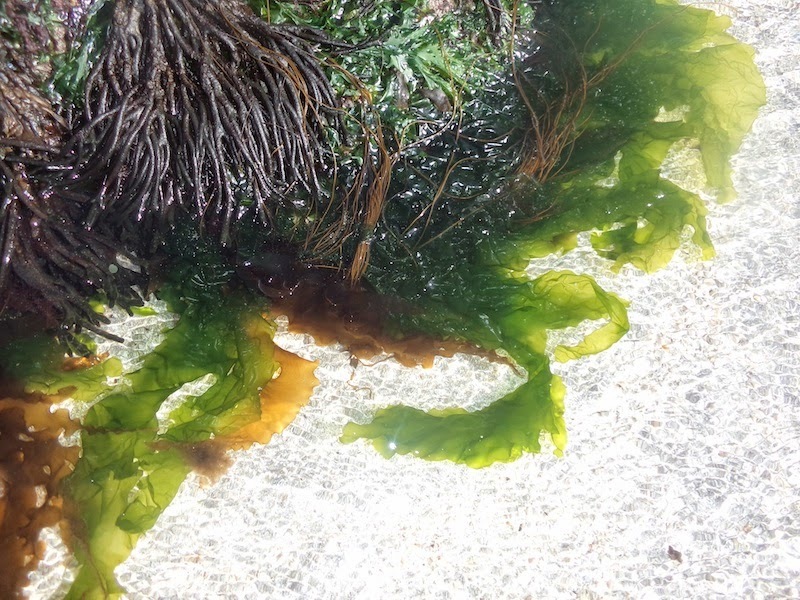 Identification is in many ways in its infancy but the good news is that unlike some fungi, seaweed isn't poisonous; some species just don't taste very nice. If you miss August 10th, don't despair there is another super moon on September 9th. Croquetas may be a little time consuming to make but once you've mastered a smooth and thick white sauce there is an infinite number of croqueta possibilities. This recipe uses razor clams but shrimp or the more traditional ham would be delicious too. In a pan heat the milk, onion and a large frond of sea lettuce and simmer over a very low heat for 20minutes. In a second pan melt the butter over a low heat and whisk in the flour to make a paste (roux). Stir continuously until the sauce leaves the sides of the pan clean. This will take at least 7-8 minutes.Very slowly add the warm, strained sea lettuce milk. Stir continuously and cook for a further 15 minutes until the sauce looks like sloppy mashed potato.Transfer the thick sauce to a bowl, add the razor clams and tsp of dried sea lettuce. Mix well, season to taste and cover with clingfilm. When cool, refrigerate for 3-hours. With floured hands make 6 cm cylinders with the croquetas mix and dip each croqueta in egg and then panko, which the final tsp of dried sea lettuce has been added to. Heat a deep fat fryer to 170ºC (or to manufacturer's instruction) and cook the croquetas in batches of no more than 2 at a time until golden. Drain on kitchen paper and keep warm whilst frying the remaining batch(es). Eat straight away. It is crucial not to overcook the clams or they will taste chewy (imagine eating a rubber band). I have tried cooking the clams in milk and using it in the sauce but it added sand not flavour. This recipe may be adapted to use sugar kelp. Seaweed is the star of this wee foraging video We had such fun. We added the pepper dulse to the boiling seawater, which the sea spaghetti was cooked in.